Established since 2010 to focus on wineries and vineyards in Southern California, the company soon developed an expertise and an extensive network in golf courses, country clubs, mountain lakeside resorts, wine country bed & breakfasts and coastal hotel/motel properties throughout California as well as the ownership brokerage of private islands, European historical castle properties in the international marketplace. The company’s yacht new build and brokerage subsidiary focuses on providing super yachts or mega yachts new build or chartering to a selected group of international clientele. The fine art and jewelry division also advises clients on how to acquire fine art paintings, sculptures and jewelry as well as on how to participate in auctions conducted by major auction houses. It also involves itself in a few selective movie productions. In 2014, the company has extended its property offerings to include many high-end luxury penthouse apartments in Paris, Monaco as well as wineries, vineyards, golf courses and castle hotels in many parts of France such as Burgundy, Bordeaux, Cognac, Provence and French Cote d’Azur and the Italian Riviera. InvestorsAlly Realty is a fully licensed real estate brokerage firm under the California Bureau of Real Estate (BRE). The BRE license number is #01523183. The company is also fully licensed under the Nationwide Mortgage Licensing System & Registry (NMLS) to provide lending services to potential real estate property buyers. The NMLS office number is #397242. The principal of InvestorsAlly Yachts is licensed under both the State of California and Florida (California DBW#B-03423-00001-CM, Florida DBPR #YSL9218) to transact ship and yacht brokerage under affiliated companies. The principals of the company are Ralph Liu and Katrina Liu (Мы говорим по русски и будем рады вам помочь.) with support staff based in its Newport Beach HQ and its three satellite offices at Corona, Temecula for coverage in Southern California and at Menlo Park in the San Francisco Bay Area for property brokerage business activities in the northern part of California. In addition, many agents in Paris and Monaco to cover the European property brokerage activities. In case you and your clients would like to see more detailed info of these business related investment properties, here are our company’s NDA templates ( 请下载并签署保密协议 ) for the agent ( https://app.box.com/s/x95e1l1nnv8jmier3ywd ) and for the buyers ( https://app.box.com/s/x95e1l1nnv8jmier3ywd ) if you do not have one between you and your buyers already. Please email us a signed copy or fax it to us at 888-315-3831. Thanks! For investment banking transactions via InvestorsAlly, Inc.’s parent company Advanced e-Financial Technologies, Inc. (AeFT), here is the link to its NDA ( https://app.box.com/s/4aua7yj036l6ogh0ssh44py7fyn6wwoc ). 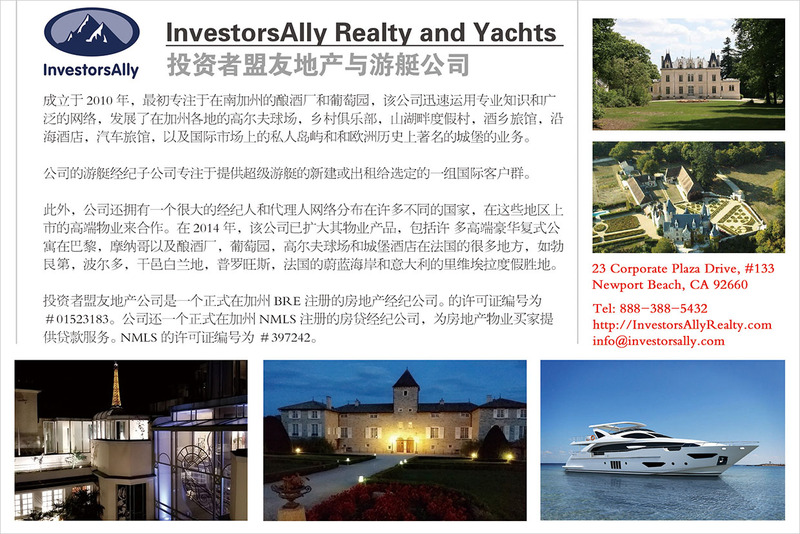 Article about InvestorsAlly Realty in the Journal International Real Estate published in many major cities in China, 2012.